Registration for our Summer 2019 CSA is now open, check out our Summer CSA page for more information. A CSA (Community Supported Agriculture) is model of agriculture in which members pay up front for a share of the coming year’s harvest. Members receive a weekly box of produce throughout the growing season. By paying up front, members help farmers by providing us with early season cash flow and with a guaranteed market. 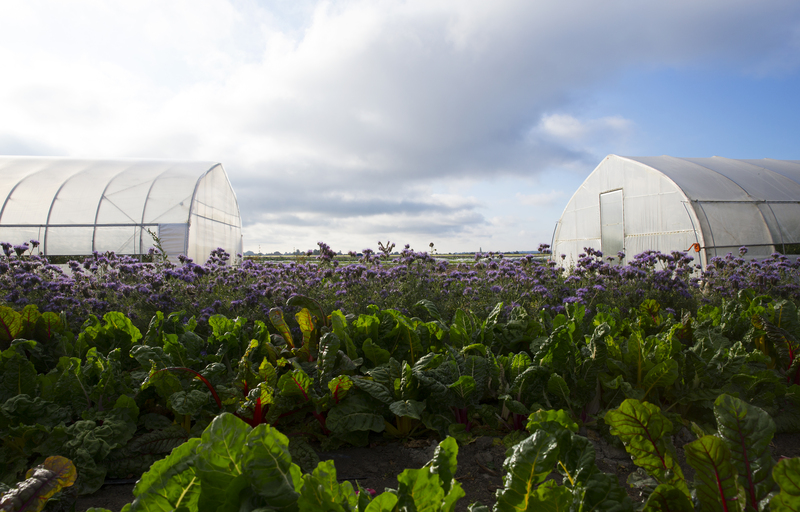 Members benefit by receiving fresh, local and nutritious produce and gain a greater understanding of where their food comes from and how it is grown. 2019 is our 10th CSA season and our 11th year farming and with the help of staff, family and amazingly fertile farmland we are able to produce some of the best Certified Organic produce in the region. Put a face to your food. Direct connection between you and your family and us, your local farmers. Expand your culinary horizons and to eat seasonally. Try things that you typically would not buy. But don’t worry we will send out recipes for garlic scapes, purple sprouting broccoli and kohlrabi. Taste! Everything is fresh, in season and at its peak. You support the local economy. We are a small family run farm and purchase many of our supplies locally too so your membership keeps your food dollars in the community. You support local, small scale, Certified Organic agriculture. Your food miles are reduced and you are contributing to regional food security and farmland preservation. You can come visit the farm and get your hands dirty…if you want! We welcome members to visit to get a hands on look at their food production and we host an autumn potluck and field tour for members. Free Flower U-Pick (throughout the summer months) and Free Pumpkin U-Pick (in October) at the farm. Weekly newsletter, full of recipe ideas, photos and farm stories. Facebook page for members to share recipe ideas. Conveniently add additional produce to your share through our members only Webstore. Flexible vacation hold policy. Members can place their box on hold, (twice in summer, once in winter) for credit towards next season or for produce from the webstore. Members receive many seasonal and specialty items that we do not market anywhere else. Great service, organized well, very clean, fresh produce & large crops. Awesome variety. You have the best CSA program! Really, you do! It’s organic, family run, love the swap box & the flower garden. And the chickens are fun to watch too. Beautiful location, what’s not to enjoy?! The weekly newsletter and your social media (FB & IG). Love seeing pics of the farm and adventures on the farm . . . It’s easy to see Cropthorne is 100% transparent and accountable. Run by a young female farmer! Affordable, local, organic, delicious, etc. Farmer and family are at almost every market chatting with CSA members. I LOVE the flowers that we are able to pick. It made our home so beautiful and the flowers you grow are gorgeous. These added touches really make the CSA community come alive. I was blown away by the flavour and freshness of all of the produce. I always looked forward to cooking . . . Also, your staff was always very helpful and friendly and knowledgeable. Love how organised you are! I am ruined for conventional supermarket veggies now. We love Cropthorne! We appreciate the variety you send us each week . . . It’s really broadened the food we eat. If it weren’t for you, we would never have tried the humble and delicious parsnip or ugly and delicious kohlrabi. Our Summer CSA is 20 weeks, it starts in mid June and ends in late October. Summer pickup locations include the farm in Ladner and home in Tsawwassen, as well as in Vancouver at the the Main St Farmers Market and Kitsilano Farmers Market. Pickup days depend on location but include Tuesdays, Wednesdays, Saturdays and Sundays. Our Early Winter CSA is 8-9 weeks, it starts in early November and ends mid December. Deep Winter pickups are at the farm. A limited number of Egg shares are available each season to add on to your vegetable share. Your choice of weekly or biweekly share of a dozen eggs from our own Certified Organic pastured hens.